We’ve been long-time fans in our house of the non-toxic miracle cleaning magic of Branch Basics! From getting day old raspberry stains out of my son’s khaki shorts to freshening up his pooped-stained white onesies as good as new & even cleaning our fresh fruit & washing our hands daily... this stuff literally does it all! And it does it all without compromising our health or taking hours of extra elbow grease just to get results! If it sounds too good to be true, I hear ya! I was skeptical at first, too! But every time I try Branch Basics on a new mess, it’s never ceases to deliver amazing results! While the dramatic Before & After posts are fun, today I want to talk all about the everyday little ways I uses Branch Basics cleaner in my kitchen every.single.day! Because if I were you (& I was thinking of investing in a whole new way of cleaning my home —like when I switched over all of our toxic conventional cleaning products to BB), I would want to know about more than just the “big ways” I could use it. Because when you use something everyday, you’re definitely getting more bang for your buck (& you can replace multiple cleaning products with BB & save even more money in the long run!) I hope our 3 daily kitchen uses for Branch Basics non toxic cleaner help inspire you to finally take the plunge & switch over to this all-in-one non-toxic alternative! You won’t be disappointed! Where your kiddo plays with toys in his highchair or not, there’s bound to be some messy fingers that muck up your little one’s fav toys. And we all know how much babies love to throw toys on our not-so-sparkly-clean floors... Maybe that’s just me?! 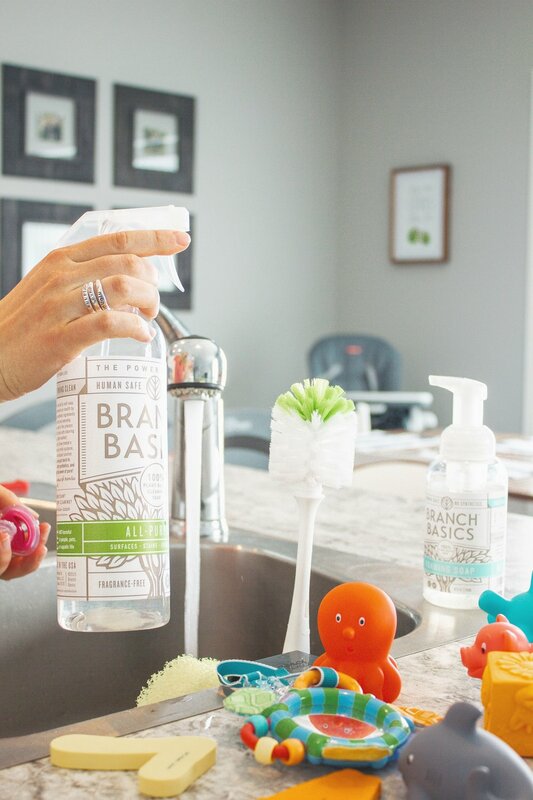 Perhaps your floors are spotless, but I love to spray a quick spritz of the BB All-Purpose Cleaner and rinse his fav toys in the sink for a quick + easy way to keep our kitchen feeling as clean and tidy as possible. We’re big fruit lovers in our house & even though we try to buy as much organic as we can, I still like to clean our fruit before eating it. A quick pump of the BB foaming hand soap rubbed over our fresh apple usually does the trick! It gives me extra peace of mind that I’m getting rid of all the grocery store germs that just plain rinsing with water can’t get off! If you’re interested in trying Branch Basics, make sure to use this referral LINK to get $10 OFF your first order! And feel free to leave a comment below with any questions! If you already use + love Branch Basics & just need to stock up, use THIS LINK to shop their latest products! I would love to hear what YOU think about Branch Basics, too! What’s your fav way to use it?! 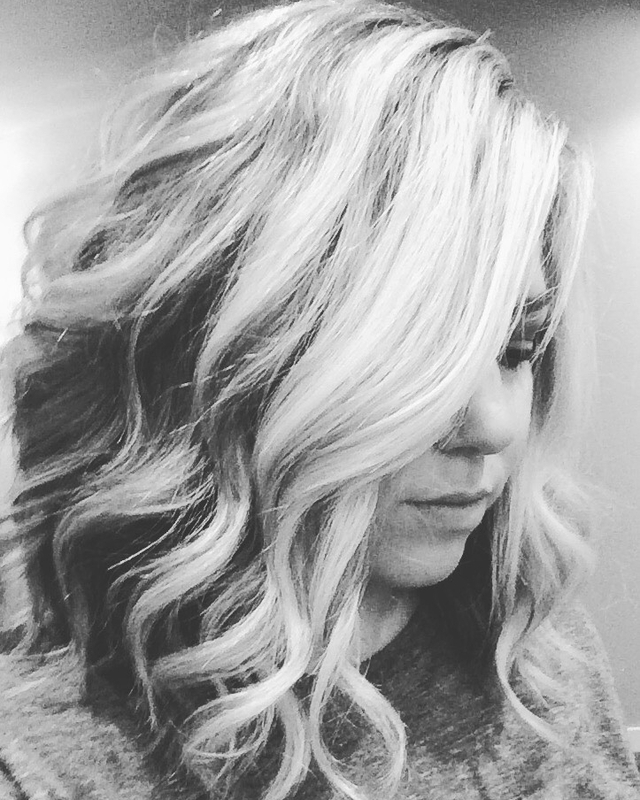 Come on over to Instagram @adrianna.bohrer & let me know - I can’t wait to hear what you think! Don’t forget you can pin these photos to Pinterest + save them for later! Keep them on your Lifestyle Board for healthy living inspo you can come back to again and again… Use the Pinterest button below or simply click on any photo to save it.